This black and white photograph shows the Atchison, Topeka & Santa Fe Railway Company's Super C train at Corwith Yards. The high speed intermodal freight train ran from Chicago, Illinois, to Los Angeles, California, from 1968 to 1976, and was considered the "World's Fastest Train". 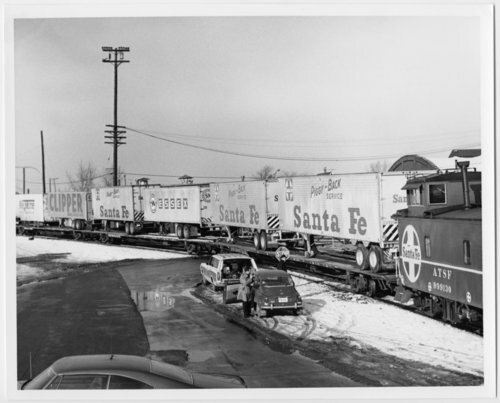 A number of Santa Fe tractor/trailers are loaded on flatcars.